The Meg has a brand-new poster that takes its influence from Jaws, but instead of a woman swimming, it's a dog and instead of a great white shark, it's a Megalodon. There were two other posters that were released a few weeks ago, one of which was the best one so far, but this latest Jaws-inspired poster takes the cake. If that wasn't enough, two new TV spots have been released as well, teasing some 75-foot-long prehistoric shark breaching action with some explosions thrown in the mix for good measure. Warner Bros. is turning up the heat on the promotional campaign for The Meg. Now that we're midway through summer and the film is a few weeks from release, they seem to just be getting started. The Discovery Channel's Shark Week begins at the end of the month and you can be sure that the little dog will get some more screen time in the promo items to come. But for now, the fate of the dog looks like it will be a tiny snack for Megalodon as she swims the beaches looking for more to eat. The two new TV spots for The Meg do offer some footage that has yet to be seen before. There's definitely a focus on showing more of the mysterious Megalodon, featuring many mouth-open strikes with the giant teeth on full display. There's also a lot more hints that the prehistoric shark is going to eat a lot of people during the course of the film and as previously noted, it looks like we're going to see Megalodon fly into the air, a trick that it may have learned from observing great white sharks. Additionally, the new TV spots for The Meg showcase Jason Statham getting into some pretty intense situations like free diving into the Pacific Ocean with only a spear gun to take on the 75-foot-long shark. Statham is also seen doing a heroic swing on to a boat, barely making it before Megalodon eats him. Even for people who were on the fence about seeing The Meg before should be pretty excited to go see this epic summer popcorn movie now, since it just looks like a hell of a lot of fun. Plus, you can sit in an airconditioned movie theater, so it's really a win/win type of situation. 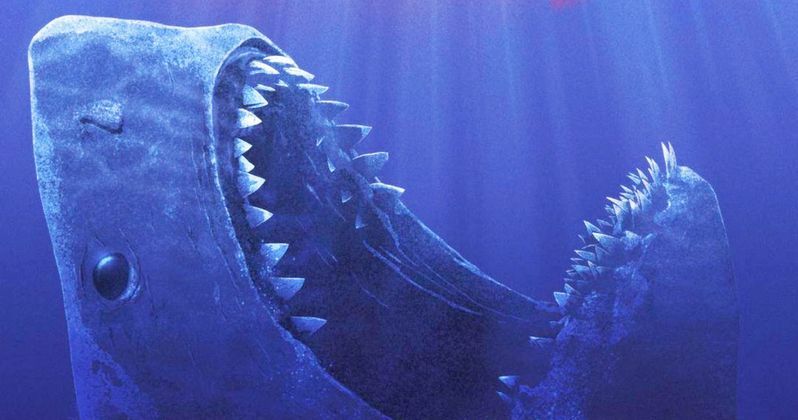 Obviously, moviegoers don't want to see a little cute dog get eaten, but The Meg may be going out of its way to state that Megalodon doesn't discriminate when it comes to eating food. Dogs, people, research equipment, floatation devices, helicopters, you name it. In real-life, scientists have found pretty weird stuff in the stomachs of sharks, so why would a prehistoric shark be any different? The Meg chomps into theaters on August 10th, and while we wait, you can check out the epic new Jaws-inspired poster as well as the two new TV spots below, provided by the Warner Bros. U.K. YouTube channel.